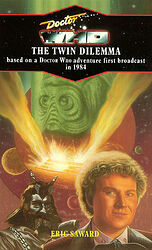 Eric Saward's novelization of Anthony Steven's script for the TV serial is quite different from most Target novelizations that just reproduce the script with a few sentences of filler to make it seem like a novel. Saward tries hard to rescue a dreadful script, but just cannot do it. The problem is that the main story makes little sense and has more holes than a golf course. Saward tries to knock some sense into the story by adding quite a bit of back story, particularly at the beginning. He also removes large sections of the dialogue, replacing either with different lines or with brief paraphrases of what was said. And to give it some pizazz, he throws in a few "Hitchhiker's Guide to the Galaxy" sidebars about goofy scientists being destroyed by their own inventions in absurd ways. The problem is that Saward is still stuck with the story as broadcast, and no matter how much explanation he adds for motivations, it just does not hang together.